17th-century light green velvet over wooden boards. Gift of Mr. and Mrs. H.P. Kraus, 1985. Richard de Loménie; Walter Ashburner; his sale, Milan, Ulrico Hoepli, Aug. 26, 1938, lot 93; Mr. and Mrs. H.P. Kraus. 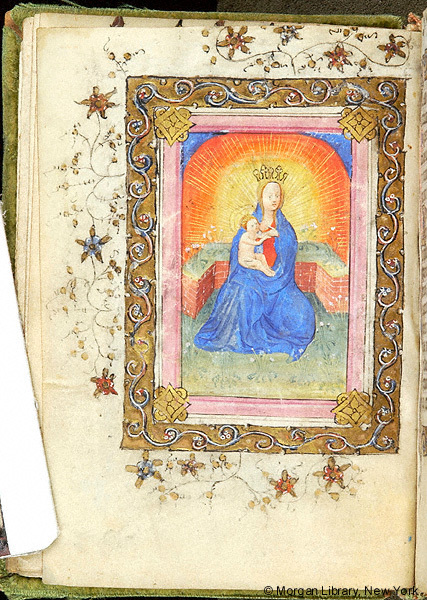 Ms. book of hours for the use of Rome (Hours of the Virgin, Office of the Dead); written and illuminated in the Netherlands, ca. 1410-1420. Artist: probably illuminated by the Master of the Beaufort Saints. Decoration: 11 large miniatures within decorative frames surrounded by full or partial illuminated borders, numerous illuminated initials with border extenders, filigree initials, and geometric line fillers; Dutch Gothic style.